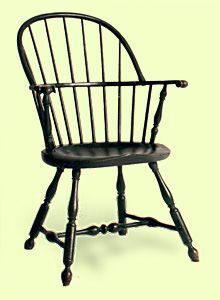 The baluster shaped turning of the leg on this sack back style Windsor chair and its scroll arm are what identify it as being a style original to Philadelphia. Like many Windsor chairs of the period, it is made using three woods, maple, poplar and hickory. It comes in a choice of finishes: paint or natural wood finish, or in an aged and distressed paint finish. This is one of the finest Windsor chair reproductions we offer.